Ateliere Fara Frontiere (RIISE’s member) and ENSIE are co-organising an European conference on “Political recommendations for fighting poverty and exclusion through work integration”. This conference will take place in Bucharest on the 7th of May 2019. The European conference “ACTIV pentru Romania.” aims at demonstrating the need for an integrated policy to mobilise those who are “invisible” and for the placement of disadvantaged groups in Romania! The French ambassador will take part in this conference. Directorate-General for Employment, Social Affairs and Inclusion has published a report on projects and organisations funded by the European Union programme for employment and social Innovation (EASI). This report showcases 7 successful and inspiring projects supported by EaSI in the 2014-2017. The report features 10 EU-level organisations that actively promote social inclusion poverty reduction and access to finance. ENSIE is listed in this report. “In 2016 ENSIE developed a methodological tool to measure social and economic impact of Work Integration Social Enterprises (WISE’s), which was applied in 10 member organisations from 9 EU countries”… Read the full report on ENSIE page 43. In the framework of the Mutual Learning Seminar on accompaniment for social and work integration of disadvantaged people, in particular people with mental, physical and psychosocial disabilities in Central European Initiative countries, held on October 16-18, 2017 project partners have published a collection of Best Practices : 18 best practices in 16 different countries (Albania, Austria, Bosnia and Herzegovina, Croatia, Czech Republic, Hungary, Italy, Macedonia, Republic of Moldova, Montenegro, Poland, Romania, Republic of Serbia, Slovakia, Slovenia and Ukraine). ENSIE and its members met during two working days in Ghent, Belgium, on June 15 & 16. This meeting was the occasion to discuss about the strategic objectives of the association and to discuss about key activities for years 2016 and 2017. 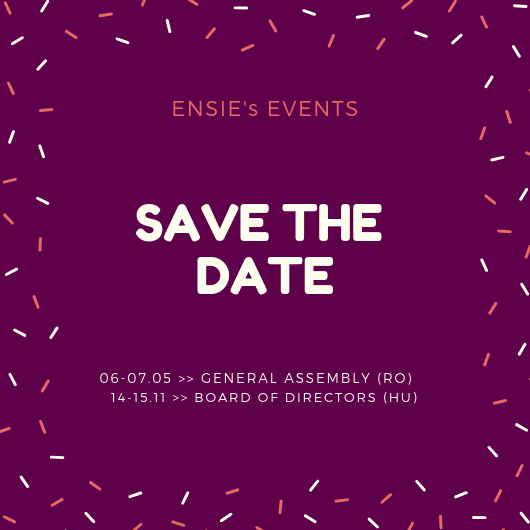 On the second day, ENSIE invited key stakeholders to debate on the current European trends: the European Pillar of Social Rights and the next steps for Work Integration Social Enterprises. The network also held the award ceremony of the competition 'Selfie on the workspace' in presence of the 3 winners organisations coming from Serbia, Italy and Romania. After the event, all participants visited the UCO, an interesting partnership between local WISEs and the city of Ghent. In April 2017 the Commission consulted stakeholders and the general public to define key priorities and shape the implementation of the ESC. This consultation builds on the initial, targeted consultation of a selection of key stakeholders in late 2016 (see below). Read ENSIE April 2017 contribution on the European Solidarity Corps here below. The Commission proposed on September 15, 2016, to set up a European Solidarity Corps. Young people across the EU will be able to volunteer their help where it is needed most, to respond to crisis situations. The European Solidarity Corps (ESC) is conceived to offer people under 30 in Europe the chance to support a non-governmental organisation (NGO), local authority or private company active in addressing challenging situations across the European Union – for instance: rebuilding communities following natural disasters; addressing social challenges such as social exclusion, poverty, health and demographic challenges; or working on the reception and integration of refugees. Read our members contribution on the European Solidarity Corps here below. In this period of crises, characterized by a high youth unemployment rate, NEETs are one of the most vulnerable groups among the others due to the lack of education, work, job culture and value that brings them to be socially excluded both from labour market and social life. Lately, work integration social enterprises have been more and more facing the issue of youth integration with those that cannot integrate the traditional labour market. What are WISEs doing to facilitate the integration of NEETs on the labour market? Examples of active labour market measures supporting WISEs in Belgium and Austria. ENSIE and its Spanish members FAEDEI and FEICAT organised the European Seminar THE PARTNERSHIPS OF WORK INTEGRATION SOCIAL ENTERPRISES focusing on WISEs partnerships with the public and private sector through best practices from all around Europe. On the 18th and 19th May ENSIE, Eurodiaconia and EASPD held a seminar on Work Integration Social Enterprises. The event aimed to introduce the important role played by WISE to incorporate socially excluded people, as well as people with mental or physical disabilities, into society, through adapted work. The report of the event is available in English and in French. Download the presentations of the event here below. February March 2014: European Parliament's written declaration on promoting social inclusion and combating all forms of discrimination in the labour market. Following the conference 'Work Integration Social Enterprises: investing in social Europe! ', several Members of the European Parliament formalised their support through a written declaration on promoting social inclusion and combating all forms of discrimination in the labour market. 14 November 2013: Work Integration Social Enterprises: investing in social Europe! Work Integration Social Enterprises key players at the European Parliament, Brussels. The conference 'Work Integration Social Enterprises: investing in social Europe!' that was held at the European Parliament in Brussels on the 14th of November 2013, gathered more than 120 participants representing at least 20 different EU member States and Switzerland. Commissioner László Andor, with his physical presence and his closing remarks, commissioner Michel Barnier, with its video message, the present MEPs and the public authorities underlined the importance of this type of social enterprises aiming the social and professional integration of vulnerable groups. WISEs need the proper financial and technical support for the services that they provide, financial adapted instruments and, in some Member States, a legal recognition. ENSIE continues to raise awareness about WISEs and obtain recognition and support. ENSIE calls to public authorities, especially national ones, to create a favorable eco-system for the maintenance and development of the social enterprises that help the most excluded and marginalized persons. Many thanks to all speakers and participants, especially to the workers who participated in our campaigns and conference. On the 26 & 27 of November, ENSIE staff participated in the 3rd EPAP Convention that was held in Brussels. On the first day, Davide Ziveri Italian representative of ENSIE shared his experience within the side-event 'In-work poverty - The Contribution of Employment to Poverty Reduction and Inclusion' co-organised by ENSIE, EAPN and ESADP. Key messages of the in-work poverty side-event - ENSIE, EAPN & ESADP. How to overcome in-work poverty in Work Integration Social Enterprises? For more information about this good practice, visit the Social club page. For more information about on the side event 'In-work poverty - The Contribution of Employment to Poverty Reduction and Inclusion' , visit EAPN's page. For more information about the anual Convention, visit the European Commission's page.